Sign up for the ObesityWeek℠ Mailing List and Read Past Editions of ObesityWeek Daily on the ObesityWeek News Page! ObesityWeek scientific session kicks off — Attendance reaches 5200! The scientific sessions kick off in full force today with both ASMBS and TOS sessions continuing from now through Thursday for ASMBS, and through Friday for TOS. 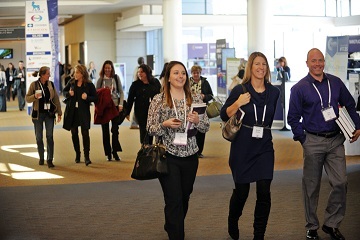 With 5200 attendees, over 100 symposia, 1500 abstract presentations and several special social events to choose from, you can build a schedule that fits your educational interests. Whether you want to focus entirely on Integrated Health, or branch out and attend a session on Neuroscience or Population Health, our scientific sessions let you explore the latest in obesity surgery and research. Having a hard time planning? Our mobile app allows you to create your own fully customizable schedule for the week. Add your sessions to the "My Schedule" tab in the mobile app by selecting "Add to my schedule" on any item on the schedule. This automatically creates a list of your sessions, making it easy for you to know where you're going. Find all the details you need in the ObesityWeek mobile app available on iOS and Android devices! The app includes a full session schedule, interactive maps, speaker information, and more. The app will provide the latest up-to-date information on any changes to the ObesityWeek schedule, making it a great tool for planning your schedule for the week. 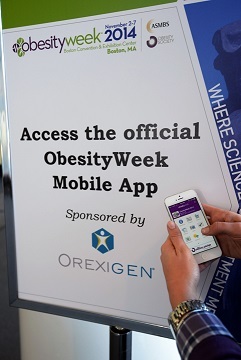 Search "ObesityWeek" in the App Store or Google Play to download the app. Information is constantly updated in the mobile app, and specific course locations and times may be subject to change. Your app will receive automatic updates whenever new information becomes available. All ObesityWeek posters are displayed during exhibit hall hours. ASMBS poster presenters are asked to stand by their posters during refreshment and lunch breaks, allowing attendees to interact with presenters and ask questions about each poster. ASMBS posters are displayed from Tuesday - Thursday. Each TOS poster will display a unique QR code, which will allow you to access more information about the poster directly from your smart phone. Instructions for downloading a QR code reader and scanning the code will be available in the poster hall. Congratulations to TOS Section poster award recipients. Find more details about this year's winners here. ASMBS and TOS poster abstracts are now available on the ObesityWeek website and as documents in the mobile app. Search for "ObesityWeek" in your phone’s app store to download the app and view the latest abstract information. Several abstract presentations also cover the latest on bias and stigma. Don’t miss these posters in BCEC — Exhibit Halls A & B1: T-2075-P, T-2114-P, T-2464-P, T-2599-P and T-2769-P.
What is the best two-stage approach to bariatric surgery? Should we be banding the sleeve and gastric bypass operation to enhance outcomes? What surgeries should we offer patients with Type 2 Diabetes? The foremost thinkers and surgeons in bariatric surgery come together in an open debate about each of these issues, while attendees share their opinions. IFSO's "Controversies in Bariatric Surgeries Worldwide" debate will be held in Room 204AB at 3:45pm today. Moderators Luigi Angrisani, MD, Mathias Fobi, MD, and Natan Zundel, MD guide the speakers through each of these topics in a fast-paced debate. Each of the three main topics will include debate in favor of and opposed to each topic, followed by question and answer directed at both of the speakers. Each topic will receive 10 minutes of debate per side, followed by 10 minutes of Question and Answer. You loved it and we brought it back! Take time to visit Booth 106 in the Exhibit Hall to have a professional digital headshot taken by our photographer. You will be able to use your photo for future professional and promotional opportunities — no more scrambling to find a professional photo on your smartphone or Facebook profile! There is no cost to meeting attendees; photos will be taken on a first-come, first-served basis. Smile! There will be photography throughout the ObesityWeek event by TOS and ASMBS staff, professional photographers and media. Please keep in mind that you may be in photos posted to social media and some photos may be used for future ObesityWeek conferences. Discretion is always used in selecting tasteful photos for promotional purposes, but if you have any concerns with your photo being used for marketing, please contact us at communications@obesity.org. TOS Hot-Topic Forum on pharmacotherapy presented several up-and-coming drugs, devices, and nutritional supplements now in development. Kobo Iki, Vice President for R&D at BAROnova, described the Transpyloric Shuttle® System, a small device that is one-fourth to one-sixth the volume of the gastric balloon. The shuttle can move freely in the pylorus to delay stomach emptying and increase feelings of satiety. The device has been well tolerated in early studies, and a multicenter, randomized, sham-control, blinded study is planned for 2015. Also at the Pharmacotherapy Forum, Zafgen CEO Thomas E. Hughes, PhD, discussed the drug beloranib, a covalent inhibitor of MetAP2 enzyme. In five clinical trials, the drug has been linked to metabolic and hormonal changes that lead to reduced hunger and weight loss. Dr. Hughes explained that increases in both FGF-21 and adiponectin drive the body to use fat as an energy source. In addition, metabolomics studies show increased plasma long-chain fatty acids, glycerol, acylcarnitine, and ketones, indicating that beloranib liberates fat and ensures its oxidation. The reduction in hunger with the drug is thought to occur when the body senses the changes in nutritional status. Dr. Hughes noted that Jennifer Miller, MD, will present the results of beloranib in Prader-Willi syndrome in poster T-2587-P Thursday afternoon from noon – 1:30pm. The TOS eHealth/mHealth Section Meeting, Reception & Business Meeting is being sponsored by ZAMZEE this year, and will take place today from 6:30-9:30pm in room BCEC – 210C. Dr. Sherry Pagoto is this year's EMS PIONEER award winner, and will be speaking at the meeting. The Pioneer Award was launched at the 2012 inaugural session of TOS eHealth/mHealth Section (EMS) to recognize those who have demonstrated excellence in the field and paved the way for further advancements in the use of electronic and mobile technologies to enhance obesity research, prevention and treatment. Dr. Pagoto is the third winner of this award, following in the footsteps of Dr. Wendy Nilsen and Dr. Bonnie Spring. Zamzee will also present at the meeting, along with James McClain from NCI and Paulo Bonato from EBMC. Food and drinks will be served! Please join us! New research reinforces the idea that the brain can control eating behavior, and considering the long-term consequences of your food choices may help control food cravings. Two research studies showing the way you think about food can have an impact on appetite, and many others on the relationship between the brain and eating behavior, will be unveiled this week at The Obesity Society Annual Meeting at ObesityWeek 2014 in Boston. With Orexigen and Takeda's weight-loss drug Contrave (naltrexone and bupropion) on the market as of last month, the triumvirate of new prescription obesity medications, which includes Vivus's Qsymia (phentermine and topiramate) and the Arena/Eisai drug Belviq (lorcaserin), would appear set to take on the health problem that the Centers for Disease Control and Prevention has declared an epidemic. Research shows that 140 million American adults are recommended for behavioral weight-loss treatment, with 83 percent of those considered for pharmacotherapy, according to a report released by The Obesity Society. Thirty-two million adults are recommended for both pharmacotherapy and behavioral treatment, and are also potential candidates for bariatric surgery. The newly formed Department of Nutritional Sciences at Texas Tech University is positioning itself to be among the world's leading programs in obesity and nutritional sciences with substantial contributions to this week's annual scientific sessions of The Obesity Society at ObesityWeek in Boston. After setting new records for attendance at the YWM2014 national convention in September, the Obesity Action Coalition scored another first in Boston Sunday. Reaching out at ObesityWeek 2014, OAC presented its first local event to an audience of more than a hundred people affected by obesity in Boston with a faculty of top experts in obesity. VIVUS, Inc., a biopharmaceutical company commercializing Qsymia® (phentermine and topiramate extended-release) capsules CIV for the treatment of obesity, today announced the following presentations at ObesityWeek 2014, Boston Convention and Exhibit Center. HMR Weight Management Services, a wholly owned subsidiary of Merck, will present new research at ObesityWeek 2014. The research demonstrates the effectiveness of high intensity lifestyle intervention programs in supporting weight loss, which can lead to improvements in health risk factors and reduce the need for medications for patients. Are you attending TOS’s 2014 Annual Scientific Meeting? Join us at the Obesity Hyperguide™ booth to explore how you can earn free CME credit and improve your clinical practice with this unique online learning platform. Informational materials detailing registration, activity options, and customizable features will be available onsite. GORE® SEAMGUARD® Bioabsorbable Staple Line Reinforcement consists of a unique, patented synthetic tissue scaffold that provides consistent, predictable performance. To learn more, visit Gore Booth #206.
for your practice and your patients. Visit us at Booth #1121. Injectafer® is manufactured under license from Vifor (International) Inc.